Story– In the past Barry helps the police arrest a kid for vandalism. He then proceeds to go about his business at work. In the future Barry now clad in Blue has a finale showdown with Gorilla Grodd where he kills him before turning his sights to the past where he plans to kill current day Flash to save the world. 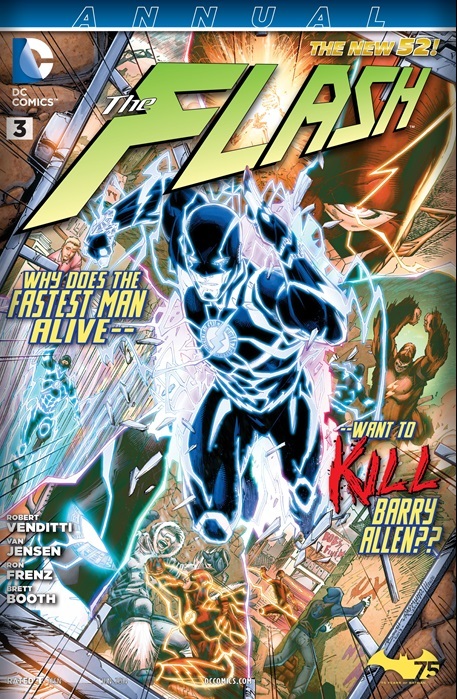 Cover-The future version of Barry Allen has a freaking sweet looking Blue costume! It’s polished, it’s vibrant and it jumps out at you while sitting on the stands. Parallel- I thought it was quite effective how the writer drew the parallel between current day Flash’s optimism and his no killing stance vs. his future self being pessimistic and his willingness to kill. Black Hero– The new 52 Wally west makes his debut. Not yet heroic but he does get some background and characterization nonetheless. Art- Everything looked good and the action flowed together nicely. RIP Wally west (90’s)– So the elephant in the room we’ve been talking about all week the new 52 Wally is black so all hopes are dashed of seeing the old Red head Wally again except in our comics of old.